New app helps Troy-based logistics firm recover from the recession. When the global financial crisis took hold in 2008, the client relationships that TPS Logistics in Troy had spent years cultivating and nurturing didn’t just wane — they disappeared. With a majority of its sales tied to the auto industry, the company had to adapt or run the real risk of shutting down. To wit: In October 2008, TPS employees, including management, were asked to take a 15 percent pay cut. And by the beginning of 2010, the firm reversed its fortunes and every employee was paid back, with interest. Riding the new wave of business, the company — which provides transportation solutions and efficiencies by leveraging its volume to drive down shipping and related costs — began to invest in smarter software programs. It also stayed true to one of its founding principles, which was to manage transportation rather than acquire a fleet of trucks. Today, with offices throughout the United States and Mexico, the company has 160 employees (75 in Troy). To drive value, TPS acquired several software firms in recent years and brought the enterprises in-house. 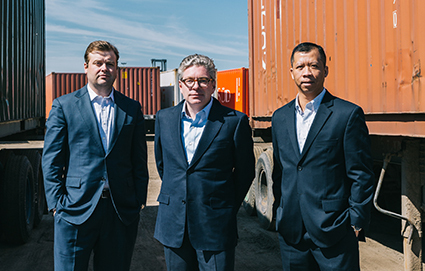 As a result, the company took what was a rigid logistics system and added flexibility to better track shipments and carbon credit opportunities. To better pinpoint the location of cargo, the company worked with Detroit Labs and others to develop Badger Application, an app-based freight tracking solution that enables logistics firms, shippers, and carriers to update and track shipments more accurately via a smartphone. Rather than calling eight people to figure out exactly where a particular delivery is, the app sends out real-time location alerts.